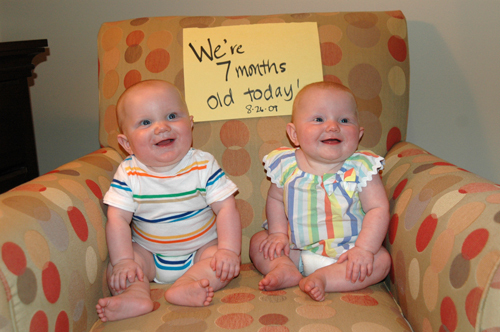 So we're bluffing here a little bit because we were on vacation when the babies turned seven months old, but here's their picture. - You are on the move, rolling around to get to where you need to go. - Sitting up and playing with everything. - Eating a fruit and veggie/meat everyday. You do turn your nose up at green beans, peaches, and macaroni and cheese. - Got your first 2 teeth. You've been a little out of sorts about it, but not too terrible. - You're a talker and love to "preach" at anyone who will listen. - You are still a pretty lazy boy and not too interested in being mobile. I think you think we're going to carry you everywhere you need to go for the rest of your life! - Sitting up, reaching, and also playing with everything. - Eating a fruit and veggie/meat everyday. Like your sister you don't want green beans, peaches, or mac and cheese. - Talking up a storm! On vacation you talked for at least an hour straight on the car ride.